Ontario's market has inflation of over 20% each of the past 3 months. The price drivers are now well known: adding supply to an already oversupplied market; exporting more electricity at rates well below the prices paid to suppliers, and capacity payments to natural gas and coal-fired generators. Nonetheless, when driving down into the data, I am astonished by the punishing reality of Ontario's electricity design: the cleaner our supply, the higher the price. If limiting greenhouse gas emissions is the goal, the system is increasingly designed to fail. Ontario fell into paying capacity payments over time. The key moments were a 2004/05 decision to offer "net revenue requirement contracts" to natural gas-fired generators - primarily to encourage market entrants to displace coal-fired generators. The enormous Lennox Generating station became less utilized and uneconomical - but the system operator felt it was necessary to the system and it started to receive contingency support payments soon after. In 2008/09 demand dropped with the recession, and the coal-fired generators (also felt necessary by system operators) also began receiving contingency support payments. Other types of contracted supply exist: non-utility generators have managed to have secret contracts for 2 decades, but it's generally understood most have must-run contracts to take all supply at a fixed price, which is also true of contracts for variable renewable energy sources (vRES - wind and solar), private hydro supply, and private nuclear (Bruce Power). The largest public hydro, and nuclear, generators have rates set by the regulator. Looking at the data from May-July 2013, and the same months in 2012, reveals the magic impact of capacity payments as replacing high cost generation with low-cost generation drives up Ontario's electricity rates. My estimates for the period in 2012  indicate that, using a levelized unit cost, natural gas and coal were far more costly than nuclear and hydro supply. In 2013 overall production drops (not as much as demand), but hydro shows strong growth, with nuclear showing the second largest MWh growth. While the two lowest cost domestic generator types showed the strongest growth, the largest declines came in the far more expensive - using levelized costs - natural gas (primarily) and coal-fired generators. There are other notable changes between the periods in 2013 and 2012, including lower exports (the cheapest supply), a suspected large, but unreported increase, in solar generation, and continuing government interference with the sector likely seeing costs of their bungled political gas plant cancellations passed onto ratepayers - but the 23.5% wholesale rate increase is partially due to a decrease in production from the higher carbon emissions, higher priced, fuels we wish to move off of. This is due to capacity payments. During the 3-month period in 2012, units with net revenue requirement contacts produced approximately 3.6 million MWh of electricity ; their payments would have been comprised of approximately $220 million guaranteed by the net revenue requirement and $32.33/MWh for the production (the average HOEP weighted to the generators' production). 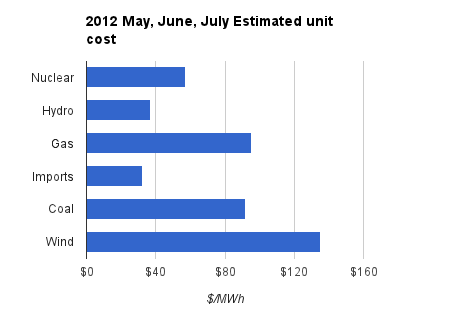 The average cost was ~$93/MWh. In 2013 the production for May, June and July dropped 56%, to ~1.6 million MWh, but the net revenue requirement changes little, and the average cost received from production (HOEP) moved up only ~$5/MWh. The average, levelized, cost nearly doubled in climbing to ~$174/MWh. The hydro figure, in particular, indicates the absurdity of the market design, where replacing supply at half the levelized cost, and 0% of the emissions, causes a rate increase. The same mechanism likely prevents customer demand management programs from achieving expected savings. Solar production increased an estimated 0.189 TWh - at a $500/MWh rate that adds $87 million. No surprises with the variable renewable energy sources (vRES). The higher the rate is above the fuel required to generate the same amount of electricity, the harsher the rate impact. Ontario's system will probably lead to high emissions, eventually, as the value proposition to consumers, also known as voters, is structured to encourage the use of facilities guaranteed revenue and therefore only having fuel costs as an incremental expense. Ontario's procurement contracts have made all generators need to be cheaper than "raw fossil fuels" - which is simply bizarre. If one were to think of designing mechanisms to reduce carbon, due to the perceived cost of externalities from burning carbon, taxing carbon would be a better approach. Carbon taxes are not going to do much to spur wind and solar generation - nor should that be the intent. The intent should be on enforcing a discipline to cost the externalities of the concern driving policy, and to align an economic desire to reduce cost with the desire to reduce emissions. Without pricing, the desire to reduce emissions is not economical, but only political. Fortunately for the bulk of the people struggling with energy questions, it is possible to learn from a bad example. Annual 20+% inflation in Ontario is one more indication must-take power purchase agreements for the politically preferred, combined with capacity payments for the operationally required, are bad policy. The average cost is estimated, from IESO data, by multiplying the hourly "total market demand" by the "Hourly Ontario Energy Price", summing the value for all hours, adding in the total value of the global adjustment, and dividing the total by the sum of "total market demand" for the period. The increase is in the Class B customer "commodity charge" which is indicated in the IESO's monthly reporting (on the second to last page). Most residential consumers will not immediately pay this rate, but the regulated price plans attempt to be set to match the Class B totals for a 6-month period; the big increases this summer were not indicated by the summer's RPP rates, so significant increases are likely to be felt as new rates are set for the winter. The sites I've included in estimating "unites with net revenue requirements" are: Brighton Beach, East Windsor, Goreway, Greenfield, GTAA, Halton Hills, Portlands, St. Clair CGS, Thoronld CGS and York.